VW Campervan Wedding Hire for your big day! Here’s what you can expect from us! Your wedding is unique and is one of the most anticipated and important days of your life. When you hire us as part of your day we will do everything to make your journey with us a special and memorable experience. Your wedding day is a very important day for you and all your family and will be a memorable experience for all. We will endeavour to make this an unforgettable transport hassle free day for your wedding party. • A Non-refundable deposit of £100 must be paid to secure a booking, which will be deducted from the balance in full. • Full payment must be made to Bellahill VW Campervan Wedding Hire at least 6 weeks before the hire date. Failure to do so may result in the cancellation of the booking. • Payment in full is required at time of booking if the hire date is within 6 weeks. • Reservations will be confirmed in writing by Bellahill VW Campervan Wedding Hire once a deposit has been received. • If a cancellation is made the deposit of £100 will not be refunded. • If a cancellation is made with more than 6 weeks before the hire date then the balance minus the £100 deposit will be refunded. • If a cancellation is made within the 6 weeks of the hire date there will be no refund given to cover loss of earnings. • Bellahill VW Campervan Wedding Hire cannot accept responsibility for adverse weather conditions, or acts by other persons or organisation which may impact adversely on the Hire Date. All will be done to maintain appropriate standards despite difficulties outside Bellahill VW Campervan Wedding Hire’s control. • Bookings can be made for winter months however the Hirer should make alternative provision if the vehicle is unable to attend due to adverse weather such as snow or icy driving conditions. A full refund will be given only in these circumstances. • Bellahill VW Campervan Wedding Hire will not accept responsibility for unavailability of the Vehicle due to breakdown, traffic congestion or accident. Bellahill Campervan Hire will not be liable for any losses, missed connections or functions however caused. • The Hirer is fully responsible and liable for any damage caused whatsoever inside or outside the vehicle by themselves or any member of their party on the Hire Date. The Hirer is liable for the total cost of the repair at a garage specied by Bellahill VW Campervan Wedding Hire. In addition the Hirer will reimburse Bellahill VW Campervan Wedding Hire for loss of bookings whilst the Vehicle is out of commission. • The Hirer will levy a £100.00 valeting charge if any vehicle is misused through food, drink or illness to rectify the damage caused. • Bellahill VW Campervan Wedding Hire do not accept responsibility for any personal belongings left in any Vehicle. The Hirer must ensure that all possessions belonging to the Hirer or any of his/her party are removed at the end of the Hire Date. Responsibility will not be accepted for the holding/storing or safeguarding of any items left in the vehicles. • Campervans are fitted with 2 Seatbelts in the rear. Due to the age of the vehicle the wearing of seatbelts in the rear is not compulsory. • Children must remain seated at all times for their own safety and for the safety of the driver. • No child under the age of 3 can be carried anywhere in the campervan due to seatbelt regulations. • Bellahill VW Campervan Wedding Hire may from time to time take photographs at your event which may be used in marketing materials or their own website. If you object to this please advise us at the time of booking. • As a courtesy we ask the Hirer to liase with their Photographer to ensure photographs are taken with the vehicle as soon as is convenient after the ceremony in order not to subject the Hirer to further time charges. • A maximum of 5 passengers can be carried in the Campervan (not including the driver). • “Agnes” is very well-maintained the vehicle is serviced regularly and with a thorough inspection carried out before each hire. However due to its age we cannot accept responsibility for mechanical, electrical or other types of breakdowns. 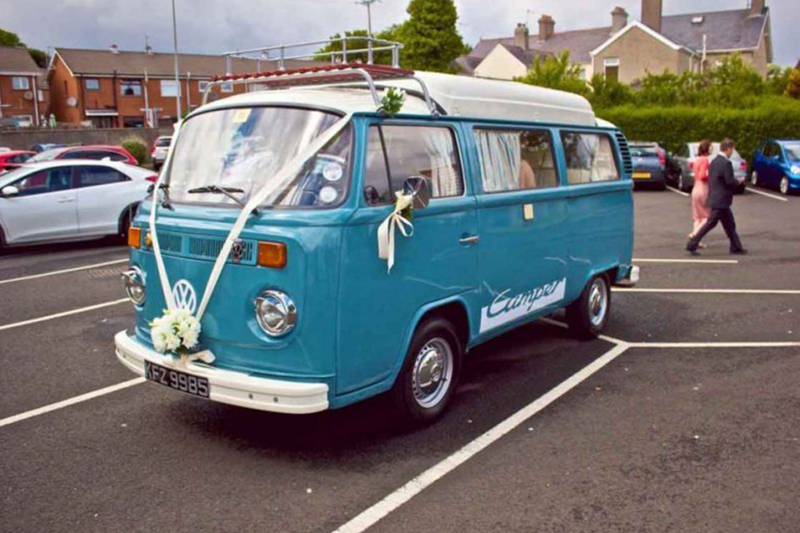 In the unlikely event of a breakdown Bellahill VW Campervan Wedding Hire will make every effort to make the required repairs to get you to the church on time. The vehicle is covered by AA. • If a vehicle was to breakdown en-route to the Ceremony we will give a full refund on that vehicle – limited to the value of that booking. • Bellahill VW Campervan Wedding Hire has a strictly NO PETS policy. • Bookings are only accepted on the understanding that the Hirer fully understands and accepts the above Terms and Conditions.